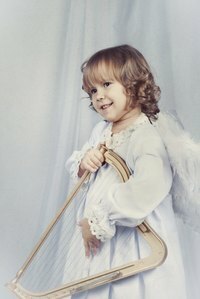 Ancient Egyptians played harps as far back as 2500 BC, according to Harp.com. Now you can create and play your own handmade version using cardboard. The harp is quick to make using items found around the house and is a perfect rainy day, church or holiday project. Draw a large isosceles trapezoid on the cardboard with your pencil and ruler. Cut the trapezoid out of the cardboard using the scissors. Place it on your work surface so the bottom base is closest to your body. Measure 2 inches from the left edge of the trapezoid and make a vertical cut to snip off the corner. Do the same thing for the right edge. Measure in 1 inch from the edge and make 1/2-inch horizontal slits along both short sides of the trapezoid. Use care to line your slits up across from each other on each side. Use the ruler to measure 2 inches in from the side of the trapezoid and 1 inch past the slits. Make a hole with the point of your scissors. Use a box cutter to cut out the center of the harp by following the shape of the outside lines of the trapezoid. Paint the harp with gold spray paint. Let dry completely. Thread a piece of fishing line through the first slit on the left side of the harp. Pull it through and thread it through the corresponding slit on the right side. Pull the line taught and tie it in a knot. Hide the knots behind the sides of the harp. If paint has dried over the slits in the cardboard, poke the utility knife into the hole to clear it. Repeat this process for all of the slits to create the harp strings. Use acrylic paints to embellish the harp with decorative designs, if desired. Look for trapezoids online that you can enlarge, print and trace to make the project easier.